Radiohead have given their blessing to an “official bootleg” of their Haiti benefit concert, held last January. A group of fans have spent the last year creating a DVD of the gig by piecing together footage shot by 14 audience members. The band allowed it to be released on the condition that proceeds went to Oxfam’s Haiti emergency fund. The film was made available online over Christmas, and has already raised more than $11,500 (£7,300). Radiohead, who are based in Oxford, played the impromptu Oxfam benefit concert at Hollywood’s Henry Fonda Theatre, but no official recording was made. But Dr Inez Rogatsky, a fan from New York, attended the gig and “taped a little bit of video”. After several more fan films found their way onto YouTube, she and another fan Andrea, who lives in Italy, came up with the idea of creating a full-length concert film. “Collecting the footage took a while – maybe two or three months,” she told BBC 6 Music. The video was then passed to a third fan, Devin, a civil engineer in California, who began the painstaking nine-month editing process in his spare time. “It was totally done on weekends, a few hours at a time,” he said. The film has little of the shaky camerawork and obscured views traditionally associated with fan videos . As Dr Rogatsky explains, that outcome was never guaranteed. “Fourteen separate video recordings doesn’t mean that there were 14 people standing there with professional equipment,” she said. “I’m pretty pleased with the outcome of a lot of the them. There’s a sequence in Morning Bell where, in the beginning of the song, Jonny [Greenwood – guitarist] is walking slowly around the stage,” said Devin. Dr Rogatsky contacted Radiohead’s manager after “a lot of procrastination”. Oxfam set up a dedicated donations page for the project with an “honesty box” system of requesting money from fans who download the film. It echoes the pioneering online release of Radiohead’s last album, In Rainbows. The full concert video was uploaded to YouTube and other video-sharing websites on Christmas Eve and, according to its creators, has been downloaded thousands of times. “It’s pretty amazing to me that this was basically 100% crowd-sourced,” said Devin. Oxfam’s Bob Ferguson added: “We are thrilled to have the support of Radiohead and their smart and motivated fans to help us raise much needed funds for our work in Haiti. Fans can show their support by heading to Oxfam’s website and donating through their “on your honor” page. 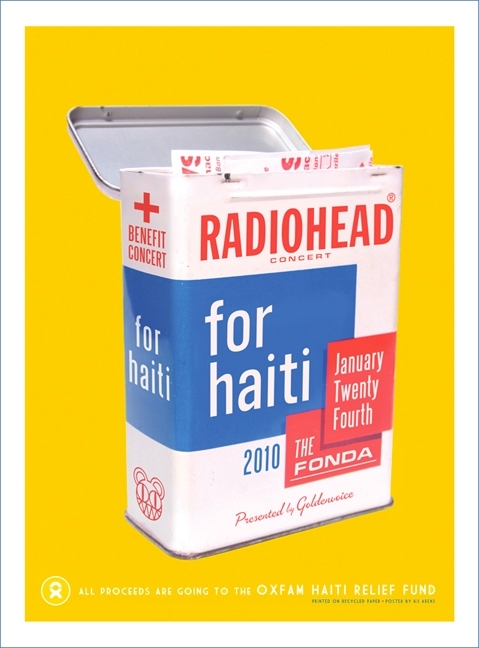 Want to buy one of the Radiohead for Haiti posters? You can purchase one of these sweet Radiohead for Haiti concert posters at La La Land Posters. They are $75 a piece, with ALL proceeds going to Haiti via OXFAM.